These pineapple bow tie cookies have been on our Holiday cookie list since I was a little guy. And, that was a long time ago. 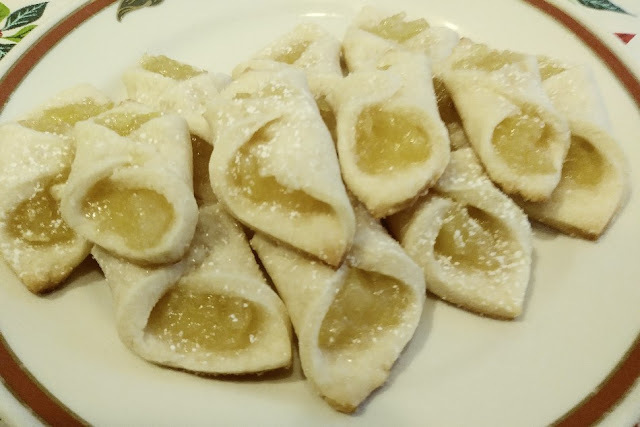 I found my mother's old handwritten recipe for these and just had make them this year. We made the dough according to her recipe but it turned out to be a failure. I just could not work with the dough. So, Fran suggested a cream cheese dough and it worked beautifully. In my KitchenAid stand mixer, I mixed the cream cheese and butter starting at low speed and then switched to high speed to make sure the two ingredients were creamed together. Turning the mixer to medium speed add the powdered sugar and vanilla. Then, add the flour and mix until the dough is formed. 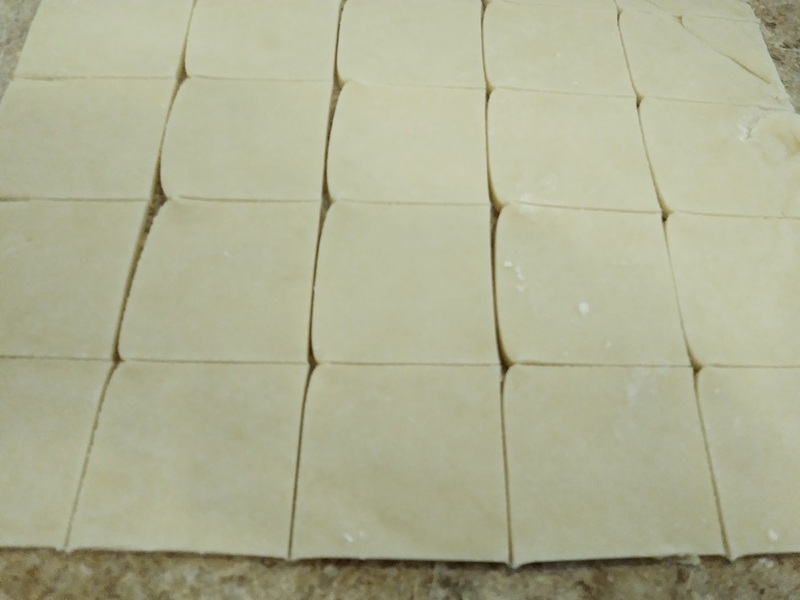 Divide the dough into two equal sections, wrap and refrigerate for one hour. Combine in a medium saucepan. Cook over medium heat while stirring until the pineapple thickens. Then remove from heat. 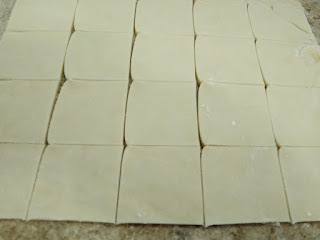 Roll the dough to 1/8-inch thick and cut into 2-inch squares. Place 1/2 teaspoon of pineapple in the middle of each square. Fold opposite corners together and press. Tip: To make sure the cookies don't open up while baking use some of the pineapple juice or just a little water to hold corners together. Place them on a cookie sheet lined with parchment paper about 2-inches apart. Sprinkle a little sugar over them and bake at 375 degrees for 8-10 minutes. Dust with powdered sugar right out of the oven. These cookies are fun and easy to make. 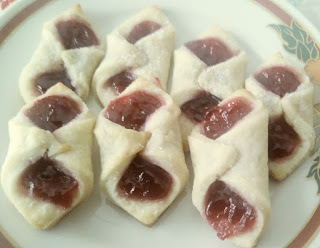 They're also very versatile because you can use any fruit filling that you like. We made some with raspberry jam right out of the jar. This recipe yielded us about 60 or more cookies. Perfect to dress up your Holiday table. Yummy, I would use strawberries or peach filling. Oh my these sound good! And, easy to make! Thanks Susan and a Merry Christmas to you and your family! I love pineapple! These would be a fun addition to our cookie table. Have a great Christmas! Thanks Carlee, and the very same to you and your family. Merry Christmas! 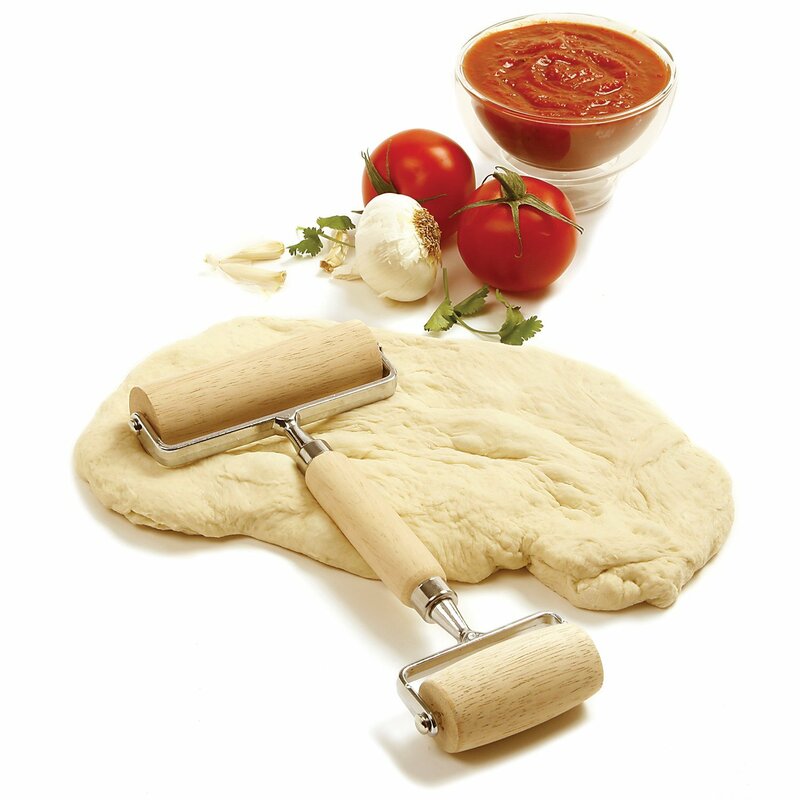 Dough can be a little tricky. I make my own dumplings and even something as simple as the weather can cause problems. Hooray for Fran and her fabulous suggestion. I do love pineapple and your bow ties look delicious. For sure Cynthia, Thank goodness for Fran. She's always thinking.